Concerned Crosspool residents are collecting signatures for a petition regarding the position of the painted white lines on Sandygate Road. 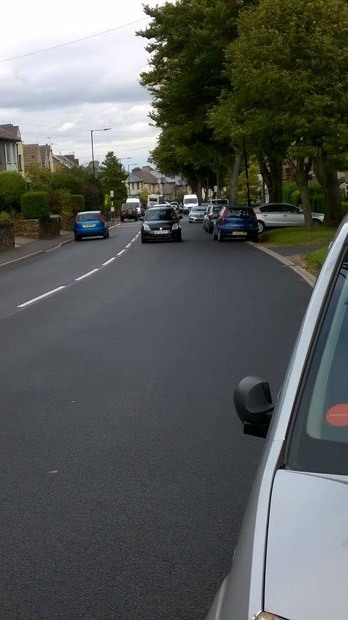 The road markings were repainted following resurfacing work and have divided the road into a wider uphill lane and a narrower downhill lane. Resident Marie Biggs explained: “My main concern is that vehicles are travelling far too fast up the road and hogging the white lines. This doesn’t leave any space for vehicles and cyclists travelling downhill towards Crosspool, which have to cross the white lines to pass parked vehicles. “Amey/Streets Ahead told me that the reason the lines are as they are is to allow for the safe overtaking of cyclists coming uphill – but what ablout the cyclists travelling downhill? The petition can be signed in GT News and the Post Office. What do you think of the position of the Sandygate Road markings? This entry was posted in council, crosspool, improvements, news, shops, traffic, transport and tagged amey, markings, safety, sandygate road, streets ahead, white lines. Bookmark the permalink. Perfectly fine. If they are moved all it will do is damage the new surface as they will require to be burned off.. Yes, the new surface may be damaged if they are burnt off but surely that’s better than a head on collision occurring? The road would be better without the white lines, thereby allowing vehicles to travel safely in both directions, where the width of the road allows and always did, when the white lines were central white lines!! The highway code states that the white lines in the road, ‘mark the centre of the road’ , which obviously is not the case!! It would mark the effective centre if those who park on the inbound to city-side were not to abandon their cars at the kerbside. If you defend that then you are creating that which you complain about. All that is required is for people to drive more carefully as they might on any narrower road. I have never seen anything so stupid in all my life and the explanation is beyond reasoning. Theres nothing worse than cycling up a hill (and lets face it, there’s a lot of hills in Sheffield) and having impatient drivers try and pass you in an inappropriate and unsafe way. I’m all for it. Just use your common sense while driving down the hill. Theres nothing worse than cycling up a hill while drivers behind you can’t get past safely so do in an unsafe way. I’m all for it. Just use some common sense while driving down the other way. 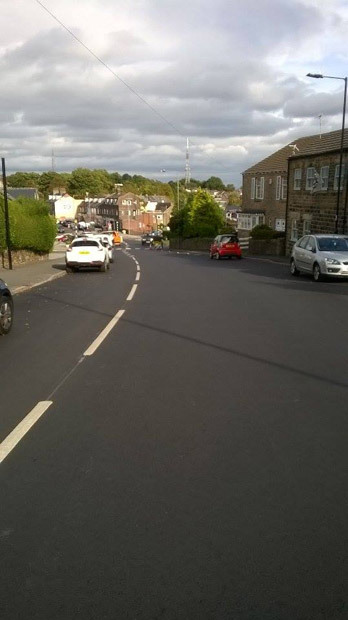 Sandygate Road is potentially dangerous for all users – pedestrians, cyclists, motorists. The main cause of the issue is the selfish and inconsiderate parking displayed by some residents. The simple solution is to ban all parking on the city-bound side of the road, on the bend and on the brow of the hill. Double yellow lines have been needed for a long time. The residents are parking outside their homes. Many of the houses were not built to allow enough space for sufficient off road parking. How is this selfish? They make do by parking as far in as possible whilst leaving enough space to allow pedestrians to pass. If it wasn’t for the parked cars regulating the speed of the downhill traffic and providing protection the downhill pavement would be far too dangerous due to how narrow it is. Parking restrictions are already in place on Coldwell Lane which should be utilised more to access Manchester Rd. Banning parking on the city bound side would only increase parking on the other side and if you walk up Sandygate Road you will see that the grass verges are quickly becoming mud verges as a result of the inconsiderate car owners who drive over and park there. If parking is banned then grass verge protection bollards should also be included. Sandygate Road was no more dangerous to users, than any other road in the city! However, since the white lines were repainted it has become dangerous!! The white line effectively reduces the road to a single carriageway, in an uphill direction! I have lived here since 1981 and have seen no serious accidents, caused by the central markings. Drivers in both directions could drive safely using the whole width of the road, even with vehicles parked on both sides of the road, by showing due consideration to each other! Now many drivers travelling uphill, feel that they have the right to drive up on the white line!! Therefore, making drivers travelling downhill stop, unnecessarily, to avoid crossing the white lines! Again, I ask, what would happen if there was to be a collision and you were the driver travelling downhill and straddling the lines? Having previously worked for an insurance company, I feel that the person on the wrong side of the white lines will always be deemed to be at fault!! Would that be fair, when the road is plenty wide enough for both vehicles? Many locals feel that the road would be better with no markings! Thereby, allowing people to drive in both directions, where the width of the road allows, and showing the courtesy that should always be shown whilst driving! Hopefully, when the markings are audited this month, sense will prevail!! If you want to take the public with you, you need to properly consult and inform them so they understand what is proposed/planned. It would also allow Amey to gain local knowledge and increase their chances of doing the right work for that area. Properly informing and consulting appears to be missing from the Streets Ahead contract – it needs to be more than road shows. Why would Amey or any rational person think that the uninformed views of residents are relevant to a decision by qualified people about improving road safety? I suspect most of this is from people who are concerned about restrictions on parking, the same ones happy to park partly on the pavement, without any thought for wheelchairs and prams. I’ve also heard that one of the prime movers is a prominent Green, normally in favour of help for cyclists, but now happy to have a stick to beat the council with. That is very interesting and probably not surprising. Removing the parking on the inbound side makes eminent sense – as well as removing obstructions on the pavement. Self-interest is rarely far from the minds of people who drive such petitions, and a ‘Green’ Party member makes this even less surprising. I need to make it clear that the petition has been initiated by Marie Biggs, has nothing to do with the Green Party and, as with most petitions, it’s best if they come from the community without any association with political parties. The issue will come up at Crosspool Forum on the 29th. A meeting between Marie, a forum rep, Amey and Cycle Sheffield might be a good way forward. It could discuss what the scheme aims to achieve including any further work still planned eg yellow lines, whether it is working and will work and if any tweaks are needed – or a bigger rethink is needed. The Forum AGM will be a good place to discuss this – I think Amey are due to attend. I live at the top of Sanygate Rd, on the side in question Chris. I have done for the last 8 years. Spending the whole of last year commuting by bike up and down it. Several years commuting by bus up and down it. I Currently walk my kids to school / nursery and back, up and down it. I spent 4 + years pushing prams up and down it. I also drive up and down it. I am an extreemely rational person, have a considerable cross section of experience of it, and have many other concerns other than simply just parking. Considering your interest in only hearing from ‘qualified’ comments I assume you are prepared to live by your own standards. Chris, as Eamonn Ward says, I am the person responsible for the petition! My first experience of the new markings, was, as I drove down the road on the day that they had appeared overnight!! I wondered why vehicles were coming straight at me in the middle of the road! Drivers assume that they can use the whole of the uphill side, purely because it is marked in the way it is! Clearly you are admitting to have not paid sufficient attention to the road. Driving on the basis of what your memory was expecting is very dangerous. D F Roberts. I was and always do, pay full attention to the road. On a road the width of Sandygate Road, there is absolutely no reason for it to be marked as it is! If drivers utilise the whole of the uphill side of the road, they are effectively reducing the road to one carriageway!! Thereby, causing unnecessary delays in the flow of traffic and putting cyclists at risk! For anyone with an interest in this matter, which appears to be 95% plus, of the residents of Sandygate Road and the surrounding area, the petition is being presented to the council tomorrow! I will keep you posted of any developments! Marie – did you get the official response to the petition from the council ? Can you share it ? “After the Open Meeting I raised this again with the council’s traffic engineers. They informed me that after zone works are complete a zone audit is carried out by Amey’s road safety audit team. They are qualified road safety auditors. The audits comply with national guidance and are specified in the contract between Sheffield city council and Amey. “This particular zone may not be fully completed until May of next year. So I have requested that, given the public concern, an audit of the Sandygate Road marking change is carried out on its own as quickly as possible, and that the outcome is made public. I hope this clarifies the position and let’s hope that the audit produces the anticipated results! Having spoken again to several concerned local residents, it seems that feelings are running high and many fear that it is only a matter of time before a serious accident happens due to the inconsiderate driving by some motorists who feel the they HAVE, to use the width of the uphill lane, purely because they can!! Thanks Marie. I had just wondered if it there was any more of any significance than Geoff posted. In December I reported that because of the concerns raised by local residents about the change to the white line on Sandygate Road the standard audit of such changes would be brought forward to January from May. I urged that it should be carried out as soon as possible.I have followed this up and have just been informed that it has now been completed. The auditor has recommended that the centre white line should be put back where it was and this has been accepted by the Council and Amey. As yet I do not know when the work will be carried out but I have urged that it should be done as soon as possible. Thank you to the residents who pursued this issue. At last!! Sense has prevailed! From the day the lines appeared I have felt that they were a serious error of judgement!! And an accident waiting to happen! Let’s hope that they are repainted quickly before such an accident happens!! Brilliant news that the lines are to be repainted next week!! Thank you to everyone who signed the petition.